Port Washington, NY - October 18, 2016 - The Songs of Love Foundation is featuring an all-star line up of musicians for one night, Wednesday, October 19th, 2016 at The Marlin Room at Webster Hall. As a special highlight to celebrate the foundation's 20th anniversary, the entire audience will participate in a live recording of a milestone "song of love" for 4-year-old Port Washington (Long Island, NY) native, Josie Johnson, who is battling a very rare gene disorder (FoxG1). The foundation offers The Songs of Love Experience™ program, as an uplifting activity for corporations and concert events because it emotionally engages the audience when they come together to sing a personalized song for a local sick child. Josie's song will mark the 27,000th recording created by the Songs of Love Foundation. 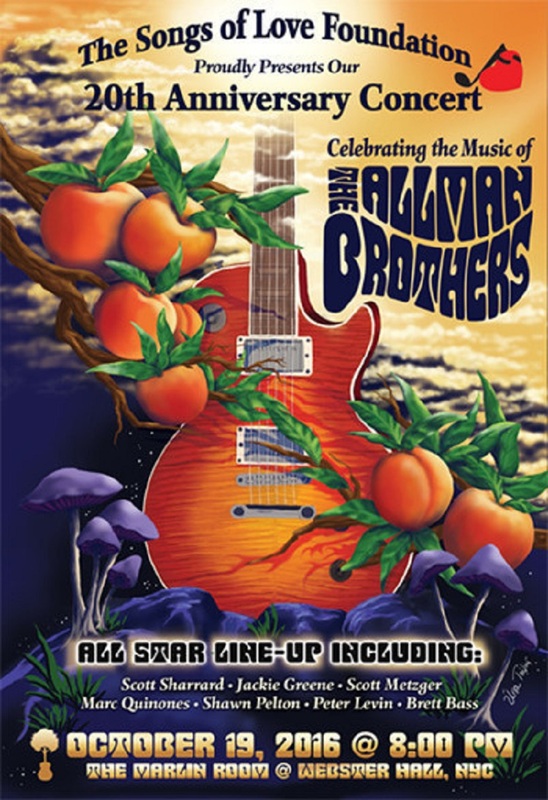 The celebration of this momentous evening continues throughout the night with the all-star musicians, some members of the Allman Brothers and Gregg Allman's solo band, paying tribute to Duane Allman and performing a recreation of Live at the Fillmore East! Doors open at 6:30PM EDT and show starts at 8:00PM EDT. Tickets are available through the event page on Facebook. Songs of Love Foundation is a nonprofit organization dedicated to creating personalized songs professionally written and recorded for chronically and terminally ill children and teens. Each song is delivered as an MP3 or CD format and contains the lyrics including the child's name and all the people, pets, interests and things they love in their lives. Songs of Love has written and recorded nearly 27,000 personalized songs since its inception in 1996. For more information on the organization, please visit www.songsoflove.org or call 800-960-SONG.